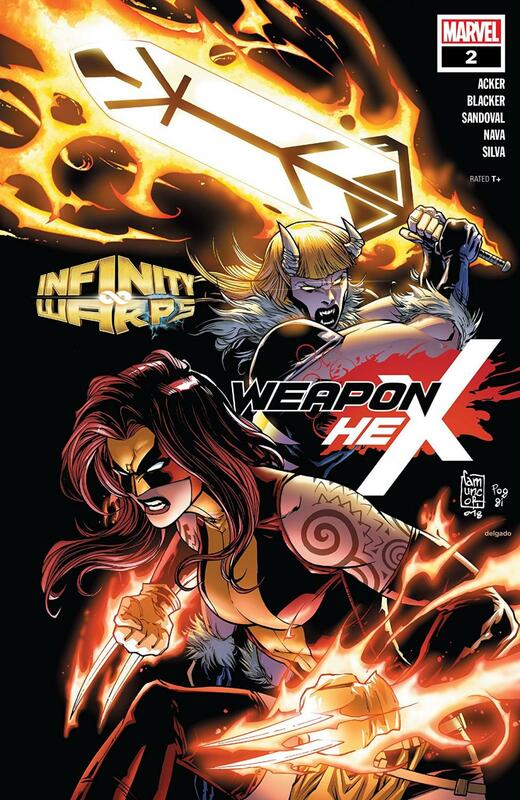 Of all the Infinity Wars tie-in series, I would have to say that Weapon Hex has been the most fun. Combining the stories of the Scarlet Witch & Quicksilver to X-23 and Honeybadger was a stroke of genius to be quite honest, especially as it using older characters with much newer ones. This issue sees the introduction of Speed Weasel as Weapon Hex’s little clone/sister and from there, it’s pretty much just wall to wall non-stop action. Acker & Blacker used the first issue for the exposition and the back story and are now using the second issue to get all the action out. Because of this, there’s really nothing much to review in terms of story and plot development. It’s basically Weapon Hex and Speed Weasel versus their creator/captor/dad?!? In an all-out fight. Since the plot is pretty bear, it is up to Sandoval to really bring it with his art and I personally think he was up to the task. Sandoval has a very distinct, kinetic style to everything he puts to page, so I know that some may not like it, but I completely adore it. He does a fantastic job with the battles and the action and a special shout out to his cool-looking design for Speed Weasel. All in all, Weapon Hex was a fun ride (minus the horrible Hex puns in the captions) and it would be cool to see more of the character somewhere down the line.